Google Gtalk is the only messenger which allows you to save chat logs straight into Gmail inbox which you can easily search for later use. Most other messagers like Yahoo, Windows Live, Skype etc has option to save chat sessions but only on your local machine. 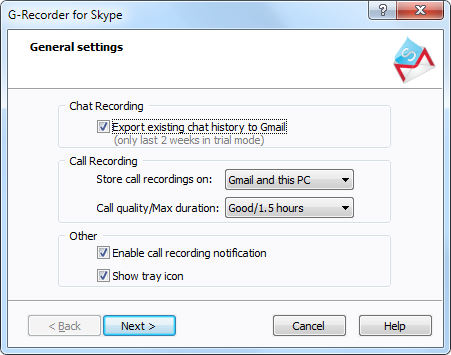 In past we have covered how you can record Skype calls using iFree Skype Recorder. Now if you have been looking for way to record Skype calls & chat session logs into your email inbox then here is G-Recorder a Skype plugin that makes it easy to record Skype calls and chats. G-Recorder will automatically send chat sessions to your Gmail account and labeled by type (Skype Calls, Skype Chats) for easy searching, viewing or listening. 1. Skype calls (MP3) and chats are stored in “clouds”, searchable and accessible to you anytime from anywhere. 2. Your Skype calls are recorded to MP3 format – you can replay the MP3’s in Gmail just in place without downloading. 3. No matter how many computers you use Skype on, your conversations are merged in Gmail from all the computers in chronological order. 4. You won’t lose Skype chat history when you change computers or just reinstall Windows. 5. Powerful and user-friendly Gmail interface to work with your Skype conversations like with e-mail. Please Note: G-Recorder is paid application and trial version can only be used for 14-days. hey thanks for sharing this idea.. If u waana know about skye lie detector ?? For record Skype you can try to use IMCapture for Skype.It’s prog for record audio and video calls.It’s must be helpful to you. I looking for audio recording for 30 to 40 min and attach to gmail. i think i will take lot of time to download and as well ad upload please suggest me what kind of software i can use. Does other version can run on iPhone4?